Q&A: Robert Caldwell, Owner of Caldwell Cigar Co.
Robert Caldwell outside the defunct Wynwood Cigar Factory, where his career as a cigarmaker began six years ago. Robert Caldwell is the face of Caldwell Cigar Co., a company founded in 2014 that produces its core line of cigars at Tabacalera William Ventura in the Dominican Republic. Caldwell entered the cigar industry in 2008, when he launched a a concierge-like service that provides cigars and cigar accessories to high-end hotels and restaurants. Today, his portfolio boasts over 10 brands made in three different countries, and he’s known for his popular collaborative blending projects with other cigarmakers. Caldwell recently sat down with assistant editor David Clough to talk about his company’s past, recent collaborations and future goals. Clough: How did you get started in the cigar industry? Caldwell: I was around 26 or 27 years old and I went out to eat on my birthday, and I leave my cigars in the car. Rather than going back to the car, I asked the waiter, “What cigars do you have?” This was Smith & Wollensky’s in Miami Beach—and they were sold out of everything and the humidor was a mess. I think, “I’m going to find these guys a company that does hotel and restaurant distribution, so they can actually have a proper humidor.” I Googled it, and there was nothing, so I ended up starting a company that sells cigars to restaurants and hotels. We write you the cigar menu, do the training for the staff, this and that. Q: How did you go from Hotel Humidor to partnering with Christian Eiroa and making cigars? A: I was continuing to build the business and I went to Wynwood with the idea of opening an office or a warehouse—something for Hotel Humidor. I was very good friends with Christian Eiroa. So we were talking and he says, ‘Why don’t you put a factory here?’ He has this idea, I have this idea, we build this idea together—Wynwood Cigar Factory. It took seven months to get the factory open. We were producing and selling about 25,000 cigars a month out of Miami with retail prices from $12 to $15. We were selling a lot of cigars, and we had a constant back order of 30,000 or 40,000 cigars. Q: How many pairs of rollers did you have at Wynwood? A: We had six pairs. All of them brought from Honduras on artistic visas. Q: What made the factory successful? A: The concept there was roll, pack, ship. So you make a cigar, it gets packaged and shipped the same day. We would produce from 8 a.m. to 2 p.m. At 2 p.m. FedEx comes—and we’d overnight all over the country. Retailers get fresh cigars the very next day. And we blended using a mixture of Honduran Corojo, Nicaraguan Habano and Peruvian Pelo de Oro tobacco. The Corojo was so sweet that it overcompensated for any bitterness or harshness that you’d have off a fresh cigar. You had a fresh-rolled experience for like 30 days, where the cigar was maybe going through a weird phase, but you didn’t taste it. So you could buy [a box of cigars], smoke half of it and kind of age it yourself. It was a really cool concept. 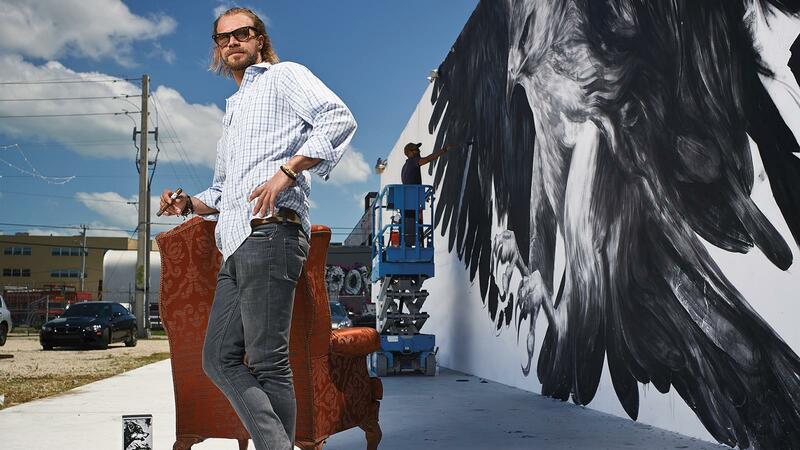 Q: The Wynwood factory didn’t stay open very long. What happened? A: Unfortunately, Christian and I had two very different visions for what the brand was, and what the brand meant in terms of everything. Q: How long did the relationship at Wynwood last? A: The total relationship was about 16 months. A: I left Wynwood and I was talking to Hernando [Caicedo, Caldwell’s business partner at Caldwell Cigar Co.] and I said to him, “Let’s start fresh with my concepts and do it a different way.” So we go down to the Dominican Republic and I had been introduced to William Ventura. He owns a factory, and they were producing amazing cigars and doing private label work. Q: What year did you launch Caldwell Cigar Co.? A: It was the beginning of 2014. ...Our first [IPCPR] trade show was that summer. ... Our goal was to sell 20,000 cigars. We went in terrified, because we had originally planned not to attend the show. And we sold around 80,000 cigars—four times what our goal was. Q: What was the allure of your products? A: We launched our brands with a very different approach. A refined, artistic, fresh kind of agenda in terms of our packaging. And we have energy—an energy that gets people interested. We were having fun. 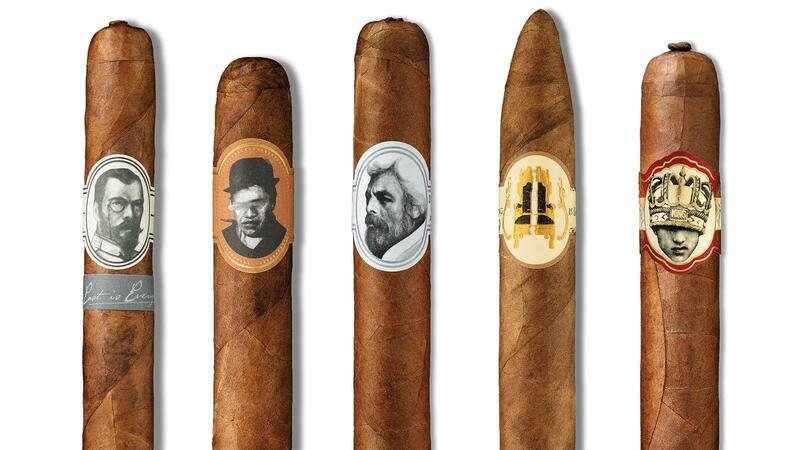 Caldwell Cigar Co.'s portfolio includes brands such as, from left to right, The Last Tsar, Blind Man's Bluff, Eastern Standard, The King Is Dead and Long Live The King. Q: Tell me about your cigar collaborations. A: After our first trade show, we were approached by Davidoff at the perfect time. They proposed making us something, which turned into Blind Man’s Bluff out of Honduras at the Camacho factory. Then Ernesto [Perez] Carrillo and I started talking at an event in New Hampshire, so I go to the Dominican Republic, call Ernesto, go by the factory, and I’m walking around and he shows me some particularly unique specialty tobaccos. We started messing around with it and that cigar became Anastasia. Q: What about Drew Estate? A: By the time we launched Anastasia, Jonathan Drew had approached me for All Out Kings. We had a few meetings—we finally had a sit down in Dortmund, Germany with J.D. with Swisher. And Jonathan proposes to me, “Let’s do something,” so we have a follow-up meeting in Miami three weeks later and it was my job to bring a brand name to the meeting. ‘Bring me a name, one word. Only one. Bring me no backup name. I want the name.’ I show up to meet Jonathan in Miami, and I’ve got the name, the best name. He says “All right, what do you got?” And I tell him: Savages. He immediately goes, “Don’t like it, what else you got?” And I’m like, “You told me to come with only one name.’ And he says, “Don’t care, what else you got.” So I said, “All Out Kings.” He loved it, so we went ahead and I kept my name Savages—and Savages became its own brand. Q: Your most recent collaborations have been with A.J. Fernandez and Matt Booth. How did they come about? A: A.J. [Fernandez] and I became friendly over the years, talking at trade shows. He wanted to work together for a long time. And Matt Booth and I were friends ever since my Hotel Humidor days. Then in January , Matt decided to leave Davidoff, announced his retirement. I was caught off guard. He told me, “I never got to roll out a grand finale product.” That’s where the idea of a collaboration came from. He flew down and talked with A.J. and at the same time I was talking to A.J. and he still wanted to work together. And this triangle came together. So we worked on The T. and Matt and I worked on Hit & Run. Q: How many cigars did Tabacalera William Ventura roll for you last year? How about the other factories? A: Last year, Ventura production, for us, I want to say around 800,000 to 900,000 cigars. Third-party production, 600,000 to 700,000 cigars. Q: Are your cigars sold in other markets besides the U.S.? A: We sell in over 11 markets overseas. We now have Sweden, Denmark, Norway, Germany, Switzerland, France, The Netherlands, Belgium, Luxembourg, and Lebanon, United Arab Emirates and United Kingdom. Q: Where would you like to see Caldwell Cigar Co. in the next few years? A: We’re not yet an everyday household name. Our strategy starting out was building cigar brands, not building our company brand. When you walk into stores you have guys that have never heard of Caldwell, but they’ve heard of Blind Man’s Bluff. A lot of our packaging doesn’t say our name on it. So were going to slightly adjust our packaging so that our name is going be on the boxes and on the cigar bands, so all of the products tie in. This article first appeared in the January 23, 2018 issue of Cigar Insider.